This was the first time Leonida attended the competition. One could say she cleaned the prize table. She was the fastest in the trot test, the best mare to attend and the best first-timer. 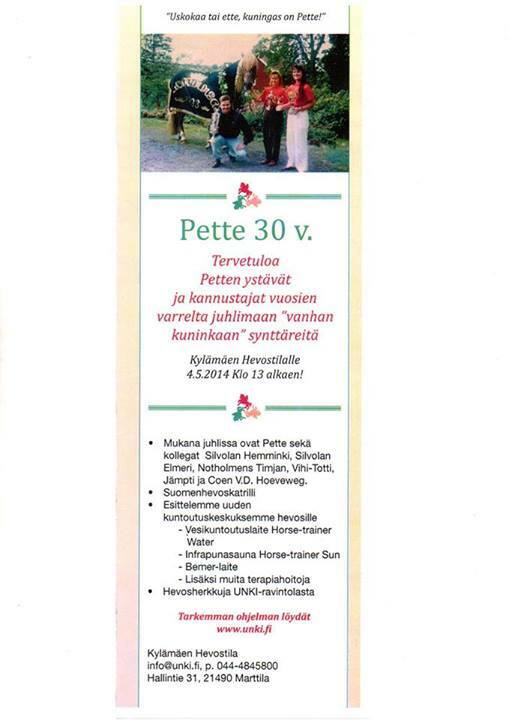 Second place went to mare Vikspertta, who was the youngest horse to attend – only five years old! Two-time work horse champion, mare Vilpotar placed third. The first prize was 1 500 euro. – It’s great to see that hard work pays off. Leonida is an honest, fine family horse, told Matti Pakarinen, whose wife Tarja and daughters Veera and Viivi also like to take part to the daily stable routines back home. Pakarinen has had Leonida since last October. – I appreciate the work that Veikko Herranen (the previous owner) has done with her. Leonida felt good, but I didn’t expect us to win, since there were so many good horses against us. – Maybe not. She might be in foal next year. But if she’s not, we’ll come to compete again. Leonida lost a shoe during the competition, but managed to pull through all the tests. There were about 500 people watching the competition. This was the 30th anniversary for the work horse championships, which has been organised annually since 1984. The work horse championship is an annual competition for studbook inspected mares and stallions. There are three tests: 1000 m trot, 500 m walk with 500 kg carriage, and finally the pulling test, where the horses pull a sleigh in sand. The start weight is about 500 kg, the horse pulls 20 m at a time. More weight is added to the sleigh during the breaks. This continues until the horse stops or the vet calls it off (the horses are naturally under strict surveillance throughout the tests). The horses receive points for each test and the horse with most points wins the title of the champion. Matti had a camera with him through the competition. Click here to watch it on Facebook. Categories: Breeding & pedigrees, Work horse | Tags: Draft horse, finnhorse, työhevonen, work horse, work horse championship | Permalink.